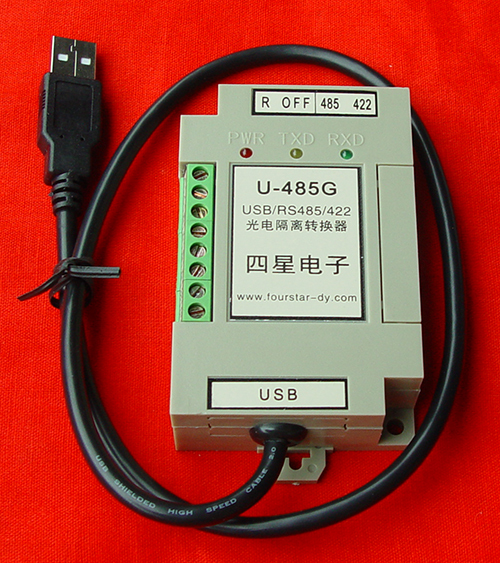 U-485G is to realize communication conversion from USB to RS485 and RS422. The power supply of the product is from the USB port. There are DC / DC isolated power modules and high-speed optical dipole in the product to respectively realize the isolation of the power and signal. Use the unique zero-delay automatic sending and receiving conversion technique and baud rate adaptive technique. Plug-and-play, suit for all software, and a transceiver enable control. And in the high resistance state when not sending data. Support multi-point communication, which is different from other similar cheap products in market. There is a built-in anti-static anti-lightning circuit in the product. Uniquely with power and sending/receiving indicator lights, the shape is the industrial structure of standard rail installation. 3, output is the four-wire full-duplex RS422 interfaces and second-line half-duplex RS485 interfaces. 7, Group website is at least 32 points. For the most points of the group website site is depend on the input impedance of RS485. U-485G can be used for point-to-point communications and multi-point communications. Except for linking several other RS485/422 interfaces, it can also make as many as 32 USB interfaces compose of RS485 or RS422 communication network, its communication range is up to 3km（4800bps）、2km（9600bps）. The addresses of each nodes are determined by the internal procedures of the equipment. Please connect the shield to the "FG" terminal of products when using shielded twisted pair,. Turn the RS485 and RS422 selection switch K1 of U-485G converters to "485", the terminal resistance setting switch K2 on U-485G of network’s terminal and initiating terminal to "R", the terminal resistance setting switch K2 on other FS-485G of the network to "OFF". Turn the RS485 and RS422 selection switch K1 of U-485G converters to "422", the terminal resistance setting switch K2 onU-485G of network’s terminal and initiating terminal to "R", the terminal resistance setting switch K2 on other FS-485G of the network to "OFF". 2, In order to prevent the common mode voltage of RS485/422 interface beyond the permitted range witch would impact the reliability of communication or even damage interfaces, you can use a low resistance wire whose cross-sectional area is 1 mm2 to connect the signal ground "SG" of each FS-485G to remove the earth potential difference of each node on the network..
3, the cable length from each FS-485G to the bus (extension) is no more than 15 m, otherwise will cause echoes and affect the normal communication of system. Best scheme is to parallel connect FS-485G directly to the RS485/422bus. 4, For the setting of terminal resistance, the role of terminal resistance is to eliminate the waveform distortion caused by the reflection of signal in the communication lines. Please turn the termination resistor setting switch K2 witch is on the FS-485G of the communication line’s terminal and initiating terminal to "R" (connect 120 ohm terminal resistance), the terminal resistance setting switch K2 of other FS-485G to "OFF" (terminal resistance is unacceptable). 6、when the communication procedures are in full-duplex mode, can only use four-wire full-duplex RS422 connection. When the communication procedures use half-duplex way, can use second-line half-duplex RS485or four-wire full-duplex RS422 connection. The addresses of each node are determined by the internal procedures of the equipment. 7、can not extend the USB interface cable. 8、Annex: a CD-ROM drivers is with the product.